This "Etruscan Library" started off on Ancient Sites (sadly now off-line), and was first compiled by "Tuscus Sempronius" on that site. The references in the original library were used as a nucleus for this new library, and I gratefully acknowledge the previous contributions of Tuscus Sempronius to this project. If you have a suggested addition or improvement, please send me an email, together with a review if possible. This book takes account of recent archaeological findings on the social and cultural exchange between the ancient Etruscans and Greeks. It redefines the Etruscan identity in the face of Greek, Eastern and Italian alternatives. Numerous artefacts are examined in great detail, and with many colour and b/w illustrations. Highlights the cultural borrowings in Etruscan art and architecture. Etruscan life and afterlife : a handbook of Etruscan studies. edited by Larissa Bonfante. Warminster: Aris & Phillips, c1986. This is one of the seminal books in the Etruscan field. Bonfante brings together a group of highly regarded scholars to explore the Etruscan idea that the afterlife was an extension of life, and its ramifications in the culture. Macnamara, Ellen. Everyday life of the Etruscans. New York: Dorset Press, 1987, c1973. An excellent overview of the Etruscan lifestyle. Macnamara draws on a great deal of information discovered or hypothesized in the past century. She presents a broad overview of Etruscan culture, focusing primarily on the interactions of the Etruscans with other Etruscans. Time-Life Publications. Etruscans: Italy's Lovers of Life. 1995. Lost Civilizations series. Spivey, Nigel and Simon Stoddart. Etruscan Italy. London: B. T. Batsford Ltd, 1990. A scholarly book that focuses on the geography, available technology, trade and agriculture, war, ritual, and social interaction. Excellent tables, charts, and diagrams. Grant, Michael. 1980. The Etruscans. London: Weidenfeld and Nicholson. Strong, Donald Emrys. The early Etruscans. New York, Putnam, 1968. Moretti, Mario. The Art of the Etruscans. Harry N. Abrams, inc., New York. 1970. Useful for the study of Etruscan bronzes. Also describes bronze disease and the care of Ancient Bronzes. Sybille Haynes "Etruscan Sculpture" British Museum, London 1971. Lawrence, D. H. (David Herbert) Sketches of Etruscan places and other Italian essays. Cambridge University Press, 1992. Vighi, Roberto. The New Museum of Villa Giulia. Rome: Tipgrafia Artistica A. Nardini, 1959. Bloch, Raymond. Etruscan art. Greenwich, The Pallas Library of Art series. Connecticut: New York Graphic Society. A general overview of Etruscan Art, which the publisher calls a "little museum" in print. Bloch is sometimes simplistic and subjective. There are four main divisions: Architecture, Sculpture, Painting, and the so-called minor arts, such as gold- and metalwork, at which the Etruscans excelled. This is a source best suited for a newcomer to Etruscan art who wishes to have a simple understanding and knowledge of it. Brendel, Otto J. Etruscan Art. Pelican History of Art. New York: Penguin Books, 1978. This book used to be a standard textbook for Etruscan Art classes. Nearly completed at his death, Emmeline Richardson Hill prepared it for publication. She completed the final chapter, and provided the latest information about digs and discoveries. This volume contains in-depth examinations of the various periods of Etruscan Art, without sacrificing the overall themes of the evolution of the artistic tradition. Cles-Reden, Sibylle. The buried people; a study of the Etruscan world. Translated from German by C.M. Woodhouse. London, Rupert Hart-Davis, 1955. While not rejecting the influence of the Greco-Roman world upon the Etruscans, Cles-Reden chooses to focus on the pre-Hellenic Mediterranean influences. She also provides an overview of the controversy relating to Etruscan origins. She approaches this discussion through a general understanding of the Etruscan landscape and specific examples of the famous Etruscan cities. Cristofani, Mauro. The Etruscans : a new investigation. Translated from the Italian by Brian Phillips; photographs by Mario Carrieri. Echoes of the ancient world series. London : Orbis Pub., c1979. Mansuelli, G. A. The art of Etruria and early Rome. New York: Crown Publishers, 1965. Mansuelli's book is particularly useful in its final chapter where he discusses the way in which Etruscan art shaped Roman art, and merged into it. He also spends time explaining the traditional divisions of Etruscan art, and the reasoning behind it. Richardson, Emeline Hill. 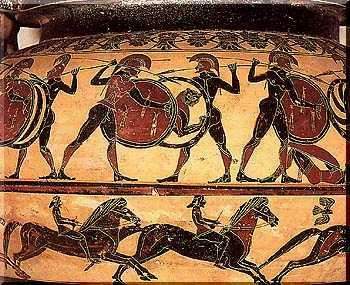 The Etruscans, their art and civilization. Chicago: University of Chicago Press, 1964. Richardson uses art to explain history in such a way as to be instructive to the art historian. She uses contemporary Greek and Roman art and literature to draw an understanding of the larger Etruscan world. The pictures are small and in black and white, but many are unique and rarely reproduced. Sprenger, Maja and Gilda Bartoloni. The Etruscans : their history, art, and architecture. Photographs by Max and Albert Hirmer. Translated from the German and Italian by Robert Erich Wolf. H.N. Abrams, 1983. This volume looks at Etruscan art from the perspective of both the Development and Characteristics of Etruscan art and genres (Architecture, Sculpture, Decorative Works, and Painting). The 288 supurb plates are arranged chrononologically and a commentary and catalogue is provided for each period. There are several useful appendices, including a listing of the known Etruscan gods and the major Etruscan cities. The Villa Giulia is the premier musuem in the world for Etruscan Art. The most famous Etruscan pieces of art (the "Roman" she-wolf, the chimera, the Cerveteri couple sarcophagus) are lodged here. This is a volume as much about the renovation of the villa and the structure of the museum as it is about the art itself. An "itinerary" or museum tour makes up most of the book. Cles-Reden, Sibylle. The buried people; a study of the Etruscan world. Translated from German by C.M. Woodhouse. London, Rupert Hart-Davis, 1955. Cles-Redden discusses the afterlife and its religious aspects in Chapter 12. She specifically discusses Christianity, and the facets of it that she suggests are Etruscan in origin, specifically the role of demons and other creatures of Hell. She argues that the Etruscan presence was felt by the Church well into Medieval times. It is a fairly unique discussion. Maule, Quentin Froebel, and Henry Roy William Smith. Votive religion at Caere: prolegomena. University of California publications in classical archaeology, v.4, no. 1. Berkeley, University of California Press, 1959. Maule and Smith discuss the role of votive offerings in the Etruscan religion, focusing on the terra-cotta sculpture offerings, with some comparative discussion of bronze votives. They focus on the styles and iconography of the votives in the larger contexts of religion and death. Meer, L. Bouke van der. The bronze liver of Piacenza : analysis of a polytheistic structure. J.C. Gieben, 1987. The bronze liver of Piacenza is a model of a divination liver - the artisan etched divisions and symbols into the bronze. Van der Meer focuses on the liver in its role as a diviner; some glancing attention is paid to the role the liver has played in the attempted decryption of the Etruscan language,the clues it provides to understanding Etruscan medicine, and its role as a treasured belonging marking the status of an augur. Regell, P., Roman augury and Etruscan divination. Ancient religion and mythology series New York : Arno Press, 1975. Regell traces the evolution of the Etruscan practices of divination into the Roman reliance on augurs and omens. He used artifacts and artwork to demonstrate the similarities and differences between the two cultures in addition to the similarities and differences of the divination practices. Small, Jocelyn Penny, Cacus and Marsyas in Etrusco-Roman legend. Princeton University Press, c1982. Small traces the Etruscan origins of the Roman god Cacus, using Marsyas as a yardstick and foil for the Etruscanization and Romanization of the Cacus figure. The use of Roman and Greek dieties as a way to understand the Etruscan dieties is an old and traditional technique. Bonfante, Giuliano and Larissa 1983. The Etruscan Language: An Introduction. New York and Manchester: New York University Press. Comprehensive, good bibliography, inscriptions, mirrors, short lexicon, grammar, etc. Livy. The history of Rome .Translated by 5 different translators. London: Henry G. Bohn, 1850. This literal translation of Livy provides a look at the Roman attitude towards and about the Etruscans. The first five chapters are the most valuable to the Etruscologist. They discuss the early kings of Rome, several of whom were Etruscan. During this period, the Etruscans still maintained a certain amount of power. Massimo Pallottino "A History of Earliest Italy" London: Routledge, 1991 and also Ann Arbor University of Michigan Press 1991. Robertson, Norman and Cryan, Mary Jane 2001. Affreschi - Exploring Etruria Tecnostampa, Sutri(VT) Italy ISBN 88-88300-007. A fascinating insight into the culture and sites of those parts of Northern Lazio which are off the beaten track. Includes 42 pages of travel essays and 32 pages of illustrations. - Well worth it for new visitors to the region. Banti, Luisa. 1973. The Etruscan Cities and Their Culture. [trans. Erika Bizzarri ]. Berkeley and Los Angeles: Univ. of CA Press. Bonfante, Larissa. 1975. Etruscan Dress. John Hopkins University Press. Bonfante, Larissa, ed. 1986. Etruscan Life and Afterlife: A Handbook of Etruscan Studies. Detroit: Wayne State University Press. Cristofani, Mauro. 1979. The Etruscans: A New Investigation. [trans. Brian Phillips] London: Orbis Publishing Ltd.
An interesting account of marine archaeology in the days before Safety was considered relevant. Some interesting discussion of marine trade in Etruscan times. Heurgon, Jacques. Daily life of the Etruscans. Translated from the French by James Kirkup. New York, Macmillan, 1964. This is a volume in the style of Jerome Carcopino, responsible for Daily Life of the Romans and the like. His chapters have a distinctly modern French-ancient Roman view; he discusses the "Moral Temper" and "The Physical Type," as well as the role of family, social structure, the role of games, and relies on the Etruscan's foes, the Romans, for this information. He applies modern "truths" to the past. Johnstone discusses the Etruscan concept of "Home," the Etruscan prowess in metalworking, and the role of children in the society, among other topics. She discusses gems and jewellery, and clothing, and takes a good look at the traditional "knowledge" about Etruscan women. These are Lawrence's essays on travelling though Italy, looking for Etruscan sites, in the early 1930s. He describes the feeling of descending into the tombs, the state that they remain in, and clearly finds the modern Italian inferior to his Etruscan forbears. It is also clear that he feels a real affinity for the early Etruscans, and for the art he finds there. He is no scholar of art history, but he does create vivid images of the past and the present. Grant, Michael. The Etruscans. Weidenfeld and Nicolson, c1980. Michael Grant, who specialized in Greek and Roman history, surveys Etruscan history with a focus on the Etruscan city. Trade, politics, and social structures all play key roles in this volume. von Vacano examines the Etruscans in terms of their place in the Mediterranean world, but focusing mainly on the Greeks and the Romans. He does include some information on links with Central Europe and the Balkans, and the Phoenicians, but information about African influences is missing. Hamblin, Dora Jane. 1975. The Etruscans. (The Emergence of Man Series). New York: Time-Life Books. Keller, Werner. 1974. The Etruscans. A.A. Knopf. Translation from German of popular account by non-estruscologist. Scullard, H. H. 1967. The Etruscan Cities and Rome. Thames and Hudson/ London and Southampton: The Camelot Press. Recently reissued. Strong, Donald. 1968. The Early Etruscans. (Life in Ancient Lands series. Edward Bacon, (ed.) G.P. Putnam. Dated popular account, which does not detract from wealth of detail about geography and climate, history, etc. Von Cles-Reden, Sybille. 1955. The Buried People. Das Versunkene Folk. trans. C.M. Wodehouse. London: Rupert Hart-Davis. Wellard, James. 1973. The Search for the Etruscans. New York: Saturday Review Press. Dennis, George. 1985. The Cities and Cemeteries of Etruria. Pamela Hemphill, ed. Abridged edition. Princeton Univ. Press, NJ. Haynes, Sybille. 1987. The Augur's Daughter: A Story of Etruscan Life. Rubicon Press, U.K.
Waltari, Mika. 1956. The Etruscan. trans. Lily Leino. G. P. Putnam's Sons. Canadian author, Lara McClintoch offers this Etruscan period mystery, which has been described as everything from 'average' to 'must read'. Quote "Another victim of Etruscomania...it's an incurable disease"
This section of the Etruscan library contains links to Etruscan sites. The pages pop up as separate windows. The objective is to categorise the links into different topics. Keep up to date with the latest news from the American Section of the Institute for Etruscan and Italic Studies. 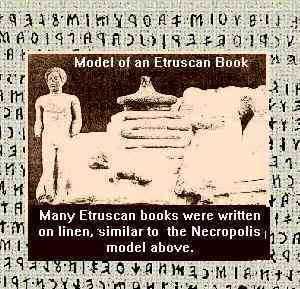 (University of Massachusetts) You can also download back issues of Etruscan News in pdf format from this New York University Site. Etruscan Texts Project University of Massachusetts Amherst site provides a searchable database of Etruscan texts. A Review of Etruscan Grammar - a translation from Dutch of Chapter 7 of "De Etrusken Spreken" by R.S.P. Beekes and L.B. van der Meer (Coutinho, Muiderberg 1991). English version of a German site explores what we know about Etruscan Language. Includes vocabulary, grammar and place names. Etruscan Vocabulary - Not active as at 7 April 2006. Links to archived site. Etruscan was related to Ukrainian. The real translation of the Pyrgi Lamellae is "Every one is bowing down, this my dear (beloved) you did hear...."
Was Etruscan a sort of Pig Latin of the ancient world? Pull the other one. Etruscan was an ancient Slavonic language. This is an incredibly detailed site on haruspicy, although I don't subscribe to the ritual side of it. Site by Graziano Baccollini. An interesting new theory. Ces pages sont destinÃ©es Ã rÃ©unir et Ã mettre en ordre des informations pÃ©dagogiques simples et pratiques sur les sites et objets archÃ©ologiques concernant tout d'abord les mondes Grecs, Etrusques et Romains. Un grand merci Ã RenÃ© pour son aide dans la traduction des "Etrusques MystÃ©rieux" en franÃ§ais. Ce site inclut la version Ã©lectronique intÃ©grale de l'ouvrage de Jean-RenÃ© Jannot, - "A la rencontre des Etrusques,"
Denne hjemmeside er den fÃ¸rste danske side helliget etruskerne. Descrive gli scavi di Veii antico. Molto interessante sito da studioso. Este sitio ofrece muchas inscripciones Etruscos.